Wrike, a work management and collaboration platform company,recently surveyed 800 marketers about their use of Agile, how it helps them get work done, and their overall satisfaction with the approach. The survey report is available on its website. The survey reveals top marketing challenges, difficulties with cross-departmental collaboration, and benefits of Agile in marketing. The survey reveals that Agile methodologies are “partially” embraced by many marketing teams. A majority of marketers has partially embraced Agile, with only 21% fully embracing Agile, and 7% not embracing it at all. 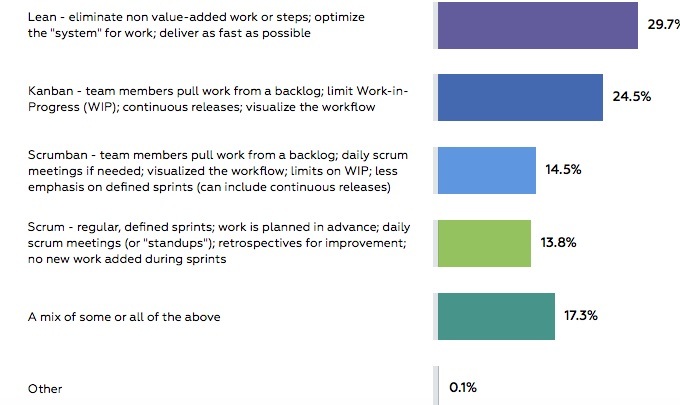 The majority of respondents of the survey, i.e 29.7 % are using Lean methods, 24.5% are practicing kanban, 14.5% Scrumban and another 13.5% scrum. The Benefits of Agile are spread fairly evenly. Teams see several benefits of Agile methods. Improved quality of work, speed of execution, and alignment of priorities are the top. The survey report also shows that heavy Agile adopters are more satisfied with their work management than non-Agile adopters. The lack of training and knowledge about Agile is the biggest barrier to implementing it as per survey results.